5.0 out of 5 starsMy cat loves it. My cat loves it. Watch the video I posted for proof :D I had it for a while now and its still good and working. While you brush, hair gets trapped and then you can simply push it, all the trapped hair you cna pick up and throw away. Very easy cleanup. My cat recommends it! 3.0 out of 5 starsPins are kinda dangerous. It doe the job well, cat fur is really smooth and matless after a brush, but thoses pins are really pointy... cuted myself on the thumb and was bleeding... you have to be real carefull when brushing cat. I have used a few bushes before and this one is my favorite and it's pretty inexpensive. The size is great for a medium sized cat so you use all pins with every stroke. The pins are not too long which makes it great for short haired cats and cleaning the brush is extremely easy. The handle also looks pretty sturdy and doesn't slip. Above all, this is the first brush that my cats don't hate! I would buy it again. We bought this to groom our 2 very picky DSH's. They absolutely love this brush. We've tried the Furminator, Kong Brush and grooming gloves prior to this. Our cats hated them all and would flee at the sight of them. Now, whenever we whip out this magical brush they both come running over for some attention. The bristles are a bit spiky if you touch them directly/individually but does not hurt if pressure is applied evenly on the whole surface. My only recommendation is for the brush to have a locking mechanism to lock the brush in retracting mode when not in use, to protect the bristles and accidental scratches. This little brush is awesome. It catches all of my cat's hair easily, and makes brushing my cats much less of a mess. Prevents hairs from going flying everywhere in the air, because it catches it so well. Disposal of the hair is super easy, you just press the back of the brush and it pushes the bristles back so the hair falls off, which is super convenient. My cat's shedding has decreased MAJORLY since I started using this. 5.0 out of 5 starsMy Cats love it. I bought this brush to help me distribute a spray-in shampoo to reduce dander. 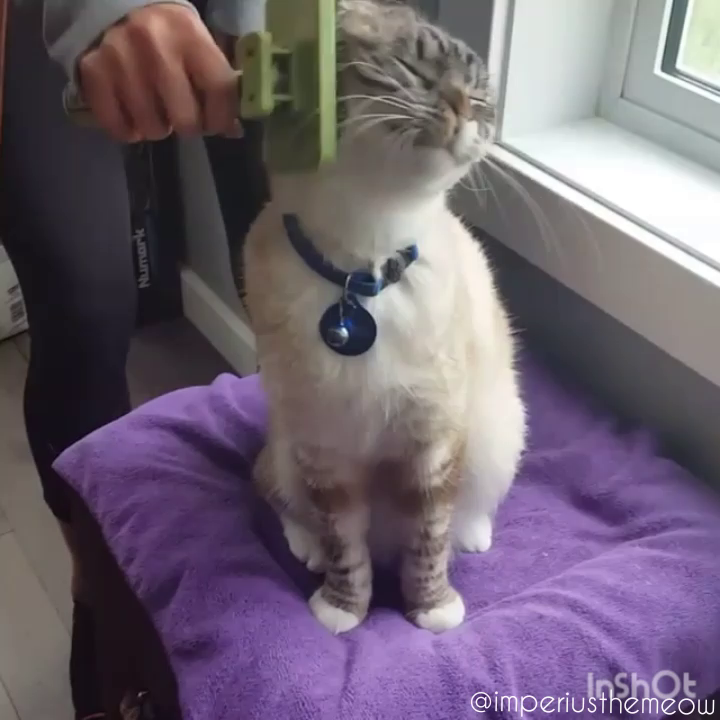 My cats love to get brushed by it so much that they don't even notice when I spray them now. Before this brush, they would run and hide when the spray hit them. I also love that I just press the button to release the hair. Super easy! 5.0 out of 5 starsIt for me a finishing brush. wich by cleaning the brush at the push of a button gives me exactly what hair was left. My cat hates grooming. It just could not be done with the brushes that I had. I was a huge cat-rodeo each time when I tried to brush it. This cat's main calling in life seems to be to shed hair profusely. With this brush, I seem to be getting a handle on the problem. The cat does not dart away. It sits still and sometimes even closes its eyes. I did not think that a brush existed that my cat would tolerate. My cat loves it. I like it as it is not a gel handle, with the green colour it made it so much easier to see white cat hair, easy to take out the hair by having that wonderful button on the back that lifts up the back plate. My cats hate getting groomed. Since I bought the safari self brush. I now have to cats fending for grooming. They even go to the brush hanger and let me know what they want. This is the best brush ever... You press the big socket looking button and the wires disappear. Instant collect cat hair no hassles. I gave a second brush to a friend and her cats love it to but it is so easy to collect the fur off the brush... Great invention!